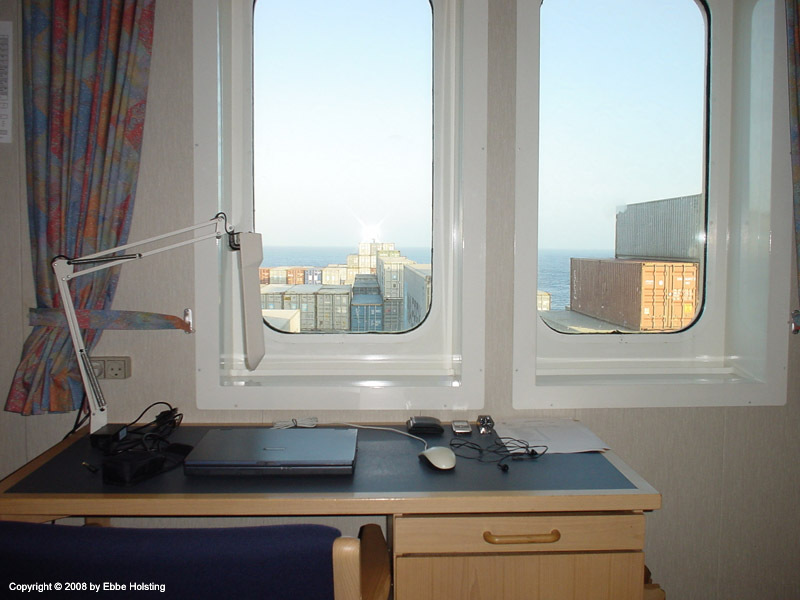 During my summer break from school from July to August 2008 I joined the "M/S Soroe Mærsk" as a 3rd Engineer. A. P. Moller - Maersk were in dire need of engineers at the time, so Dual Purpose officers who wished to go sailing for their summer holidays were sent out as engineers. Spending 6 weeks onboard solely in the engine department proved good training for me, and I learned a lot over those few weeks in terms of everyday operations and engine room watch-keeping. The following pictures and videos are all taken by me, Ebbe Holsting, and are copyrighted. However, should you wish to use them in any way please contact me for permission. Thank you! 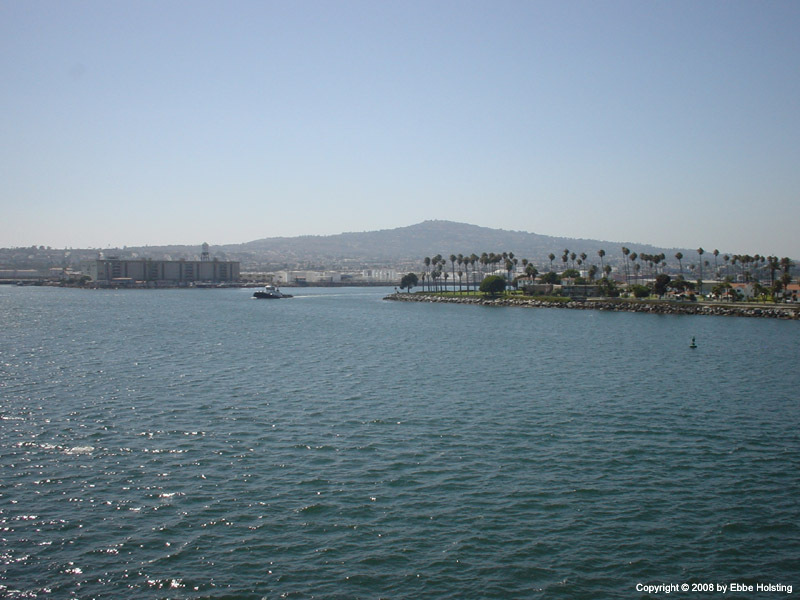 Approaching the port of Long Beach, Los Angeles in California, USA. Speed is already quite low, about 6 to 8 knots, while we are waiting for the pilot boat to arrive. From this boat a Harbor Pilot will board our vessel. The part of the ship that we are seeing here is called the Upper Deck Passage Way, this one is the port side. These run all the way from the stern to the bow in both sides of the ship, and allow access to the different container bays on deck as well as to entrances to the cargo holds. 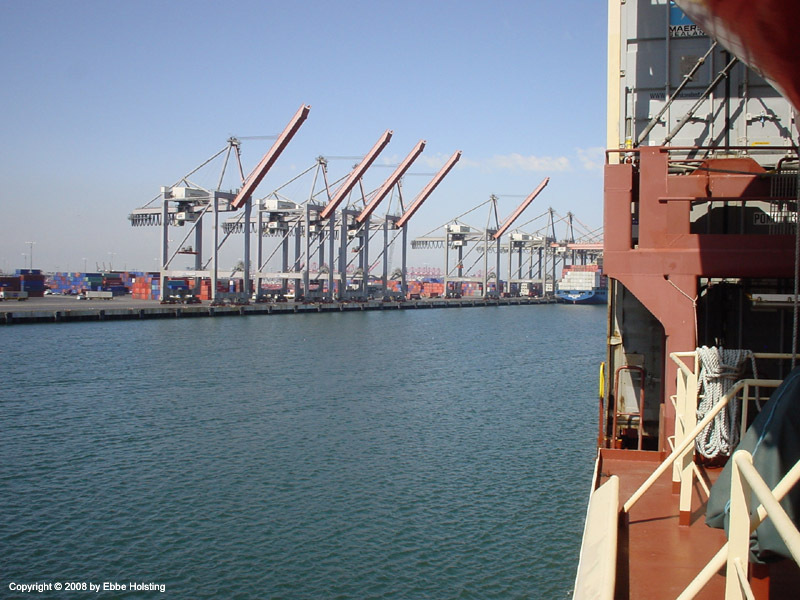 Arriving at the port of Long Beach, Los Angeles in California, USA. We picked up a Harbor Pilot a few miles outside of the harbor entrance. This is typical practice in any port. The Pilot has extensive knowledge of the waters inside the harbor area in terms of currents and water depths, and his job is to aid and guide the Captain in order to help him bring the ship safely alongside at the pier. Contrary to what most people believe, the Pilot does NOT assume command of the ship! The Captain is always in Command! Looking aft, a tugboat is just visible. Tugboats are used during arrival to and departure from almost all ports, espcecially in the case of these larger ships. They aid the ship's maneuvering inside the port by assisting during turning and athwartships thrusting (sailing sideways using the thrusters) in order to help bringing the ship alongside. Entering deeper into the harbor of Los Angeles, here we are inside the first harbor basin with one of the many container terminals. On-going construction work of a new pier in the harbor. 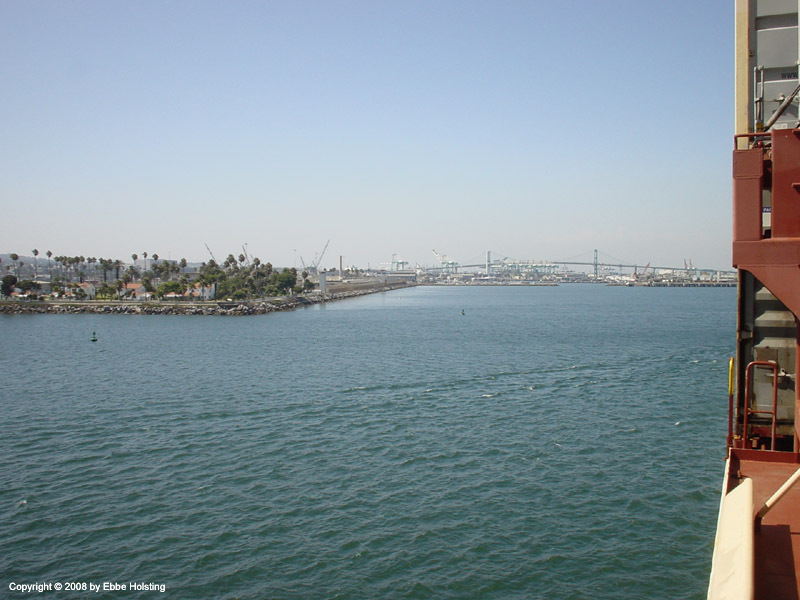 The port of Los Angeles has expanded greatly over the last few years. 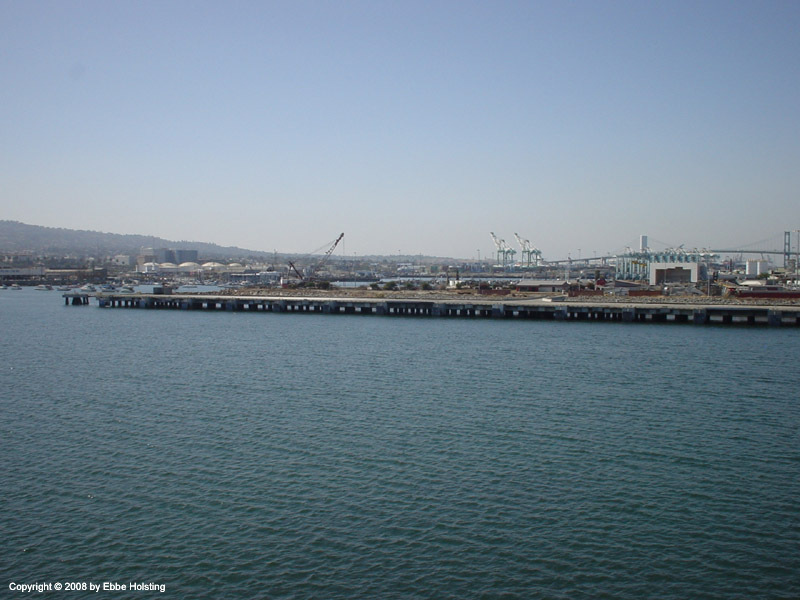 In the beginning of the new millenium the entirely new harbor section "Pier 400" was opened, vastly increasing the harbor's container capacity. A. P. Moller - Maersk vessels now moor at Pier 400. 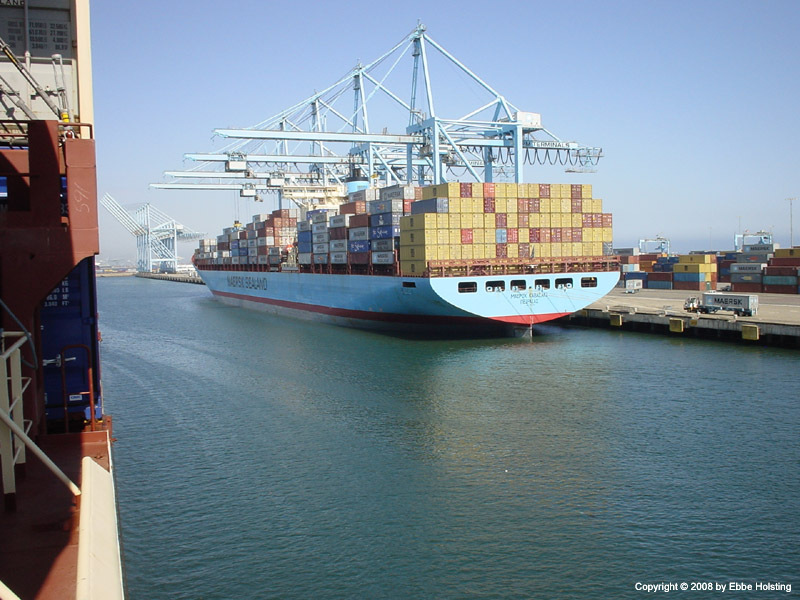 M/V Maersk Kawasaki alongside at Los Angeles. 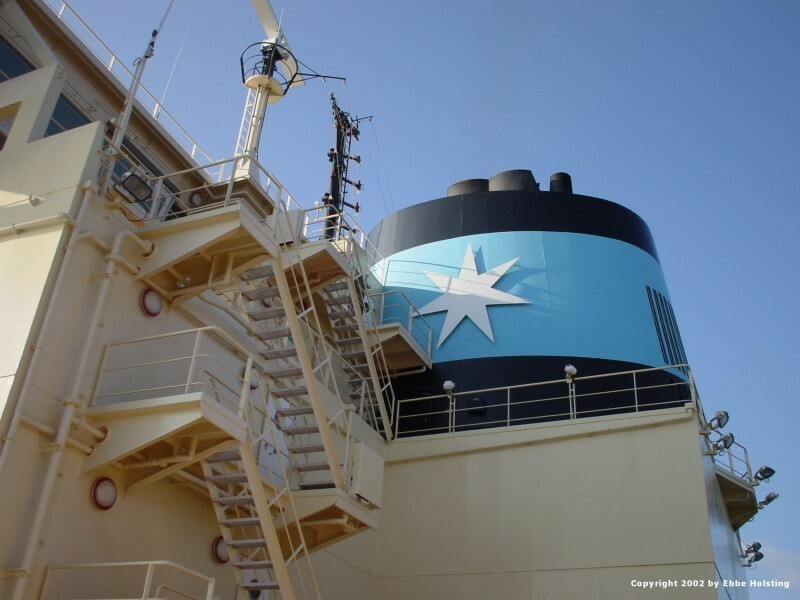 This vessel is now under Greek flag, but was previously under Danish flag with the name Kirsten Maersk. It is common practice within the Danish part of the A. P. Moller - Maersk fleet to sell off units to other companies when they are about 10 to 15 years old, and then charter (rent) them back for a further 5 years, operating them under foreign flag, before they leave the Maersk fleet completely. 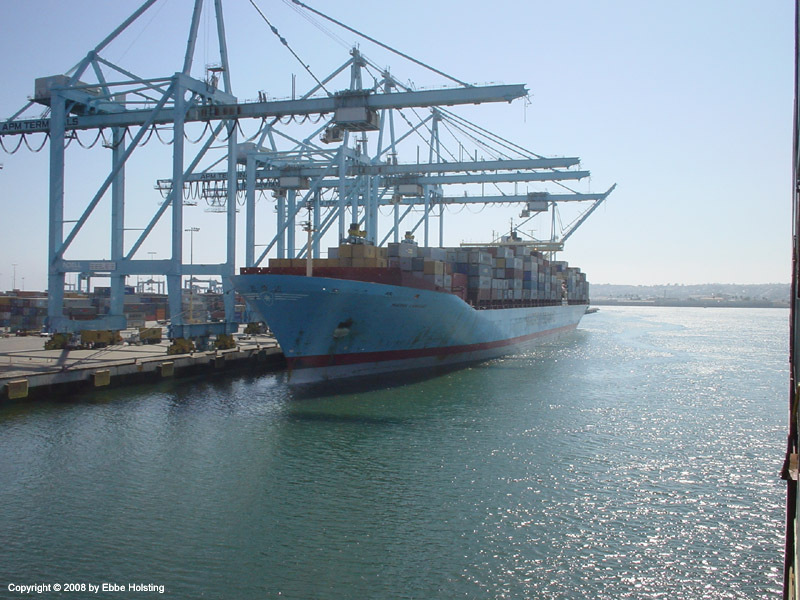 M/V Maersk Kawasaki from astern, berthed at Los Angeles. On the M/V Soroe Maersk I got a cabin on the front side of the accommodation, and during the first few weeks of my time onboard I was even fortunate enough to have a view from this cabin! 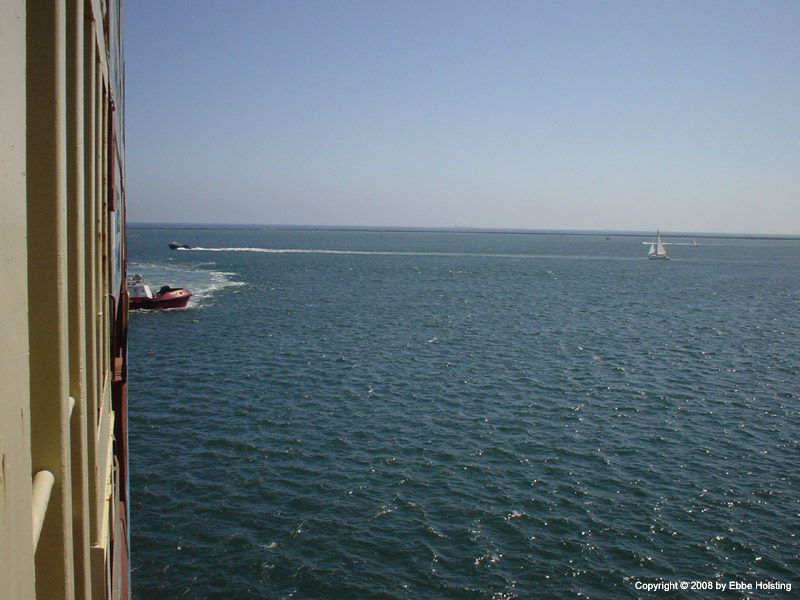 I embarked the ship in Genova, Italy, with the ship enroute to the far east. I had this view all through the Red Sea and across the Indian Ocean, but when we loaded containers in Tanjung Pepelas, Malaysia, it was over. The view was totally blocked by containers. 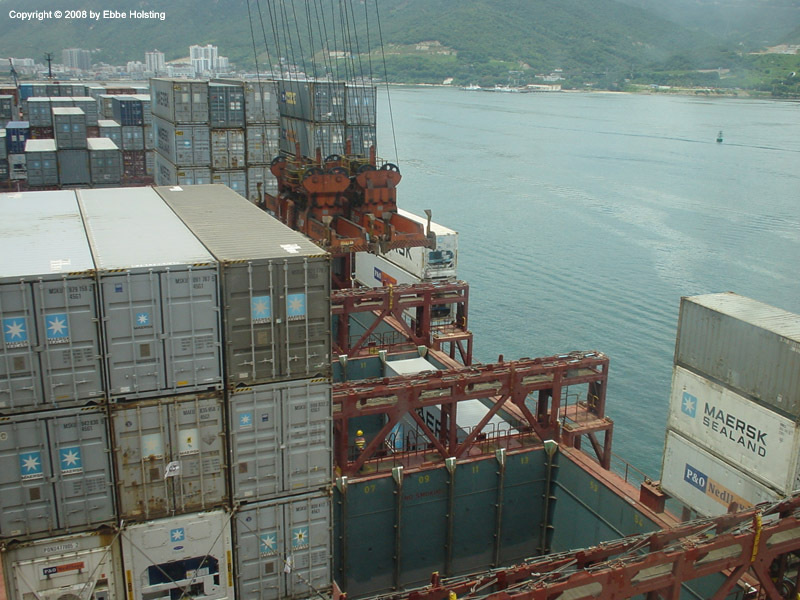 Containers being unloaded in the port of Yantian, China. Notice the open cargo holds, where the hatch covers have been lifted off. The cell guides in the cargo holds are also visible, just popping up above the hatch coaming. These cell guides guide the containers into the cargo holds, and prevent them from moving around during the transport. Note the special "double spreader" on the gantry crane. These are used in a few ports in the far east, and enable the crane drivers to lift two 40-foot containers or four 20-foot containers in one motion, thereby improving the efficiency of the the cranes. 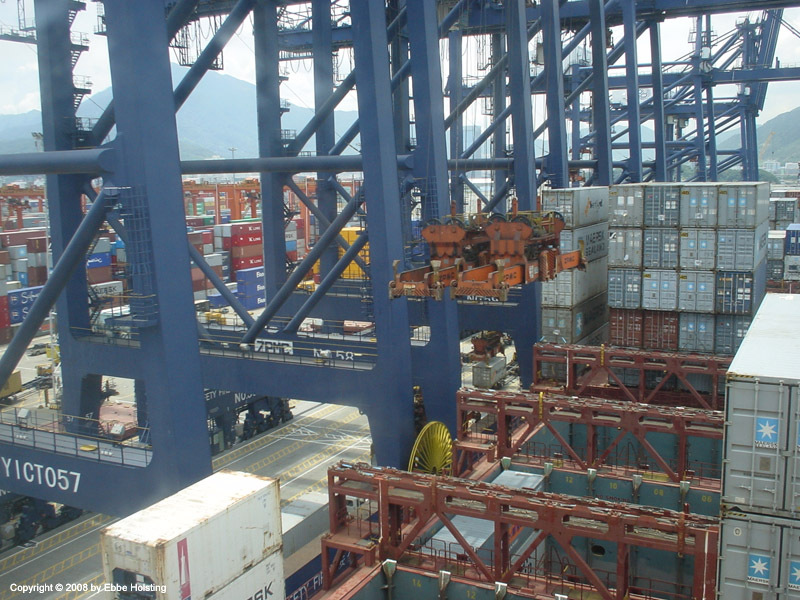 Container terminals are often compared by the number of "moves" they are able to make per crane per hour. One "move" is the loading or unloading of one container. Having a break in the Engine Control Room during maneuver watch. 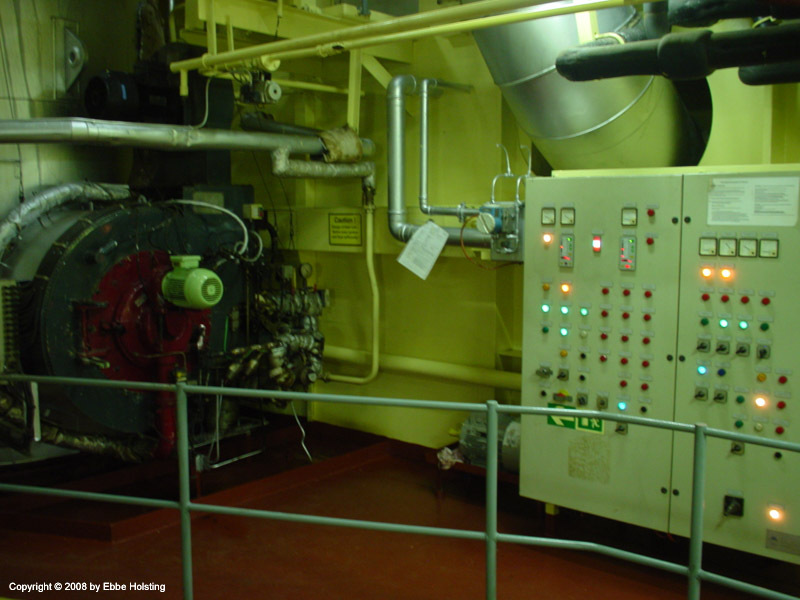 Maneuver watch is kept in the engine room during arrival to or departure from a port, or in any other situation where maneuvering with the main engine is required. During maneuver watch the Chief Engineer and the Duty Engineer (all Engineers except for the Chief Engineer alternate on duty for 24 hours at a time) are standby in the engine room. 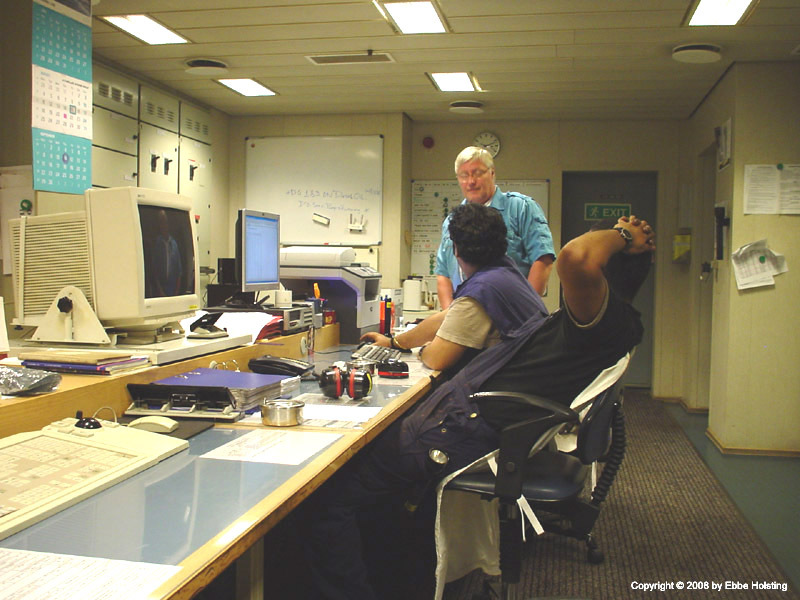 During normal sailing the engine room is only manned during normal working hours from 0800 to 1700 (typically). A view of the Main Engine from above, standing inside the Engine Casing on upper deck (upper deck is the name of the deck which is level with the outside weather deck, i.e. 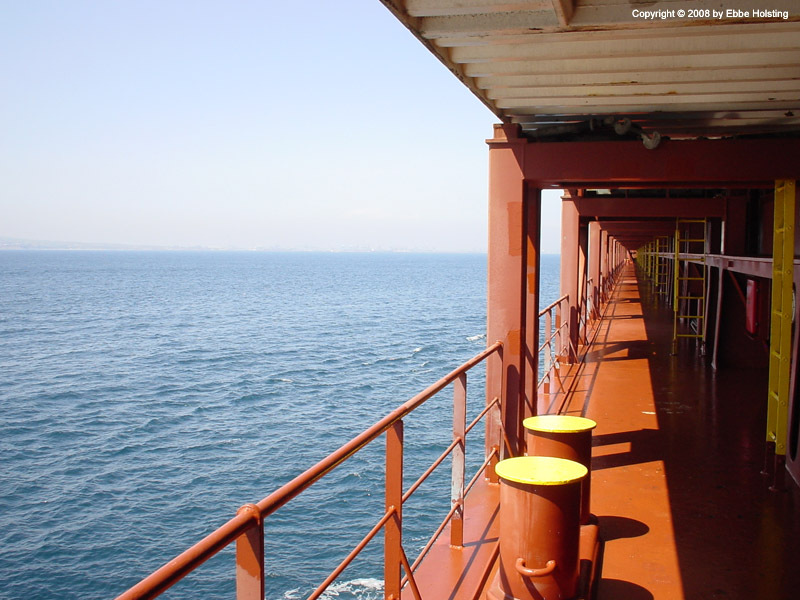 what most people would simply call "the deck" of a ship). The Engine Casing is a structure which houses the exhaust pipes from the diesel engines as well as other vent piping etc. On top of the Engine Casing is the black funnel, as visible in this picture. Still on the upper deck inside the engine casing were here have a look at the ship's Oil Fired Boiler (left) and its local control panel (right). The Oil Fired Boiler is used for producing steam for various heating purposes e.g. the accommodation (heating and warm shower water) and fuel oil preheaters etc. The Oil Fired Boiler is typically only used in port, as the ship is also fitted with an Exhaust Gas Boiler. When the Main Engine is running this boiler uses the excess heat in the engine's exhaust gas to produce steam, thereby conserving fuel consumption since the Oil Fired Boiler naturally burns fuel oil in order to produce steam. Another view of the Oil Fired Boiler. 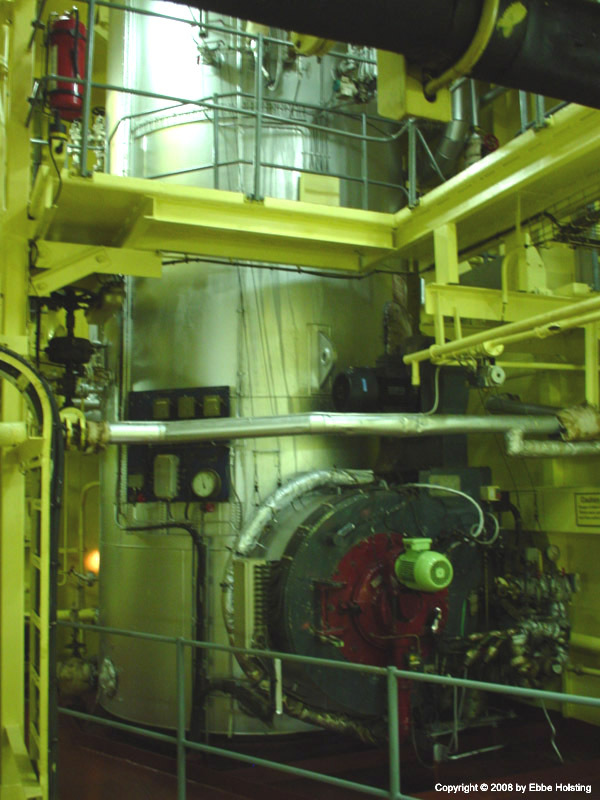 On larger container vessels this boiler typically has a capacity of about 4 to 6 tons of steam per hour, meaning that it evaporates 4 to 6 tons of water per hour. Typically these boilers operate with a steam pressure of about 6 bar. The blue/red thing in the bottom right corner is the burner unit, where fuel oil is burned off in order to produce heat. VIDEO CLIP. A view and sound of the Main Engine running at Dead Slow Ahead (25 revolutions per minute). VIDEO CLIP. A view and sound of the Main Engine running at about 80 rpm. The actual combustion inside the three nearest cylinders can be heard. VIDEO CLIP. 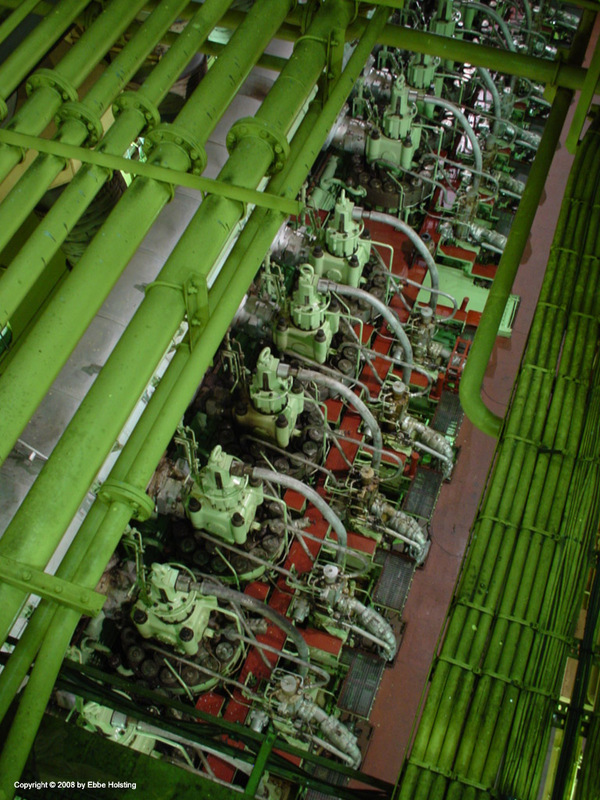 Large marine engines are started by blowing compressed air into the cylinders. Before first start after each portstay, it is common procedure to "blow through" the engine, i.e. blow air into the cylinders but without feeding fuel oil to the engine. A small valve on each cylinder is opened during this operation, whereby any water or fuel which might have leaked into the cylinders during standstill is blown out. VIDEO CLIP. Taking a walk on the "Tanktop", which is the bottom deck in the engine room. This deck is several feet below the water surface. Walking along we have a look at the fuel supply pumps for the fuel oil purifiers, a lubricating oil purifier, fuel oil supply pumps for the diesel engines, a ballast water pump, the two huge lubricating oil pumps for the Main Engine, cooling water pumps, the central cooling heat exchangers and the starboard side of the Main Engine where the crankcase expansion valves are located. The video is a bit dark, photography in the engine room can be rather tricky. VIDEO CLIP. A running MAN B&W Holeby diesel engine powering an electric generator. The Soroe Maersk is equipped with 5 of these generator sets, each producing 3.000 kW (kilowatt) of power for a total of 15 MW (megawatt = 1 million Watt). The power is used for anything from the reefer containers and electric pumps and machinery to lighting, instruments on the bridge and the Chief Stewards oven.